To ensure your preferred times, we recommend you make reservations several days in advance. If you need to cancel your appointment, you must let us know at least 24 hours prior to your scheduled time. A 100% cancellation fee will be charged if you cancel your appointment with less than 24 hours notice. We take pride in the fact that our clients never wait and are never rushed. Therefore as a courtesy to everyone, thank you for being prompt. Late arrivals can only be extended to the time remaining in the scheduled session. In the event of a scheduling conflict resulting in a last minute cancellation on our part, your next session will be given free of charge. We accept cash, checks, Visa, MasterCard, Discover, and American Express at the time of your visit. We regret that we do not bill insurance companies, however, we will provide a receipt that you may be able to submit for reimbursement. Please note that we must apply a 6.625% NJ Sales tax unless we have a script from your doctor – view sales tax letter for more information. Gratuities are at your discretion, but customarily 15-20% of the regular cost of services. Communicate openly with your massage therapist about any concerns, allergies, or areas of discomfort. All techniques include complimentary spring water. Active Isolated Stretching (AIS) is a method of stretching that is commonly used by athletes and personal trainers. It uses precise, thorough movements to focus treatment on specific muscles. First, the targeted muscle is placed in an appropriate position. Next, 8 to 10 stretch and hold cycles are implemented. Within each cycle, stretches are held for 2-seconds and then released. This serves to enhance communication between the nervous system and the musculoskeletal system, thereby promoting increased coordination, elasticity and precision of movement. Significant reductions in pain and soreness have also been reported. AIS practitioners work to promote flexibility and range of motion because they believe that a flexible body is more efficient, is more easily trained to strength and endurance, stays balanced more easily, is less prone to injury, recovers from workouts more quickly, and, as a result, just plain feels better! 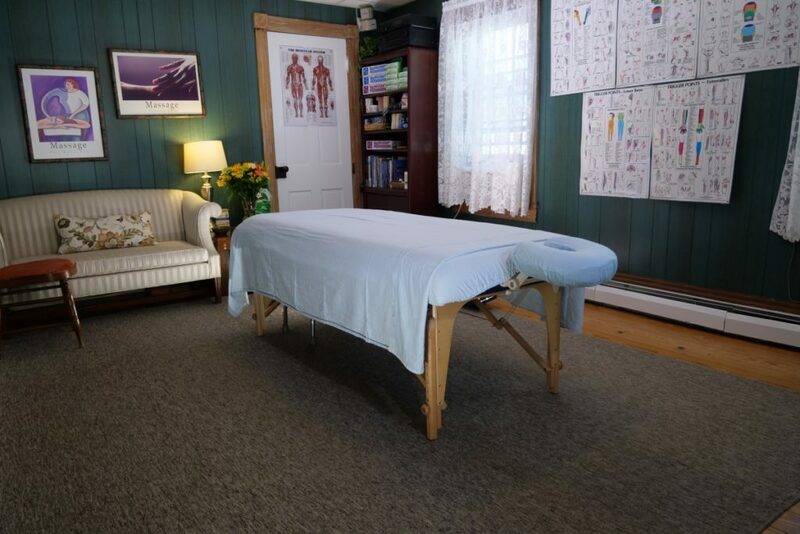 At Cranbury Therapeutic Massage, AIS is primarily practiced by Nancy Sheehan. Nancy has studied this technique extensively, with its founder, Aaron L. Mattes. In some cases, idiosyncratic aspects of posture and movement can provide clues to effective treatment. Nancy has been trained to recognize these clues, so that the treatment you receive is optimized to your unique requirements. Nancy’s AIS sessions are not only designed to help you, but to also help you learn to help yourself. Many hospitals, such as Sloan-Kettering, Dartmouth-Hitchcock Medical Center and Stanford University Hospital, provide touch therapies for cancer patients. Research confirming the benefits of these therapies is appearing in numerous reputable journals such as Journal of Pain and Symptom Management; Annals of Internal Medicine and Cancer Nursing. Studies have found that cancer patients variously experienced less pain, anxiety, nausea or fatigue, increased their immune response, and felt more relaxed after receiving massage or other touch therapies. Touch therapies can support recovery in a number of ways. Massage can increase circulation and speed healing tissues affected by surgery or radiation. Certain advanced techniques, applied with caution, can reduce swelling and restore pliability to scarred areas. In addition, due to its ability to decrease muscle tightness and increase range of motion, massage can help you feel more like stretching, exercising and enjoying recreational activities as you recover. Finally, as massage reduces pain and stress, your body is better able to rally its healing capabilities on all levels. No matter what stage of treatment, skilled and caring touch can affirm that life still holds warm, positive experiences. A one-on-one massage session can nurture you while you are undergoing treatment or adjusting to physical changes, such as mastectomy or hair loss. If you have encountered changes in your activity levels or social network, or are coping with fear, anxiety or depression, massage can provide a time for self care and acceptance of tender emotions. In cases where cancer is no longer treatable, attentive touch may provide the most consoling kind of support a person can receive. Therapeutic Massage is a light to moderately deep massage designed to relieve muscle tension, release mental and physical strain, stimulate circulation, and provide a safe, nurturing environment for deep relaxation. Cranbury Massage therapists use a combination of methods tailored to your specific needs. Using similar techniques found in the Therapeutic Massage, the massage movements here are slower, the pressure is deeper and more concentrated, and the focus is on realigning deeper layers of muscles and connective tissue. This massage will leave you feeling relaxed and invigorated. Gentle relief for fragile conditions. As the senior population grows and people live longer, the search is on for ways to cope with the multitude of issues associated with aging. Massage may be one of the answers. The elderly suffer disproportionately from arthritis, muscular stiffness, tendonitis, and bursitis. Massage therapy addresses these issues by decreasing muscular stiffness and joint inflammation and helping to increase natural joint lubrication and range of motion. Massage also causes the release of endorphins, which can act as a natural painkiller. A number of recent studies have suggested that massage therapy can also help to improve communication and reduce anxiety in Alzheimer’s patients. Please call for information about on-site treatment at home or at residential care facilities in our area. Gather your friends for a fun, relaxing get together in the comfort of your own home! We offer a spectacular menu of massages, facials, reflexology and yoga. Call us about our available services. A site specific massage is focused on a specific joint or muscle problem, for example, a shoulder, an area of the back, a TMJ or an ankle. Because the massage is focused on a particular area, the treatment is completed in a shorter amount of time (usually just 25 minutes.) As with each of the other techniques, a site specific massage can yield dramatic results in just a few sessions. Myofascial Release is a bodywork modality that seeks to rebalance the body by releasing tension in the fascia, the layer of connective tissue that holds muscles, tendons, ligaments, bones, and organs together. Myofascial tension is typically caused by continuous sustained use of particular muscle groups, for example, the forearm musculature exercised during use of a computer keyboard and mouse. At Cranbury Therapeutic Massage, myofascial pain is treated via long stretching strokes designed to lengthen, relax and reset the tone of the affected muscles. After a series of treatments, the targeted muscles and fascia become softer and more pliable. Relief derives from the improved tonal matching of muscle length to points of attachment, as well as from reduced muscle irritability and increased muscle latency. Your Therapist can also help you understand the types of ergonomic bad habits that may have contributed to your myofascial tension and that, consequently, should be avoided in the future. Neuromuscular Therapy (NMT) is a very specialized form of manual therapy. A therapist trained in NMT is educated in the physiology of the nervous system and its effect on the muscular and skeletal systems. The Neuromuscular Therapist also is educated in kinesiology and biomechanics and how to work in a clinical or medical environment. By definition, Neuromuscular Therapy is the utilization of static pressure on specific myofascial points to relieve pain. The technique involves manipulating the soft tissue of the body (muscles, tendons and connective tissue) to balance the central nervous system. In a healthy individual, nerves transmit impulses (which are responsible for every movement, function and thought) to the body very slowly. Injury, trauma, postural distortion or stress can cause nerves to speed up their transmission, thereby inhibiting equilibrium and making the body vulnerable to pain and dysfunction. NMT uses static pressure to stabilize neurological activity so your nervous system can return to normal function and overall health. Nerve Compression or Entrapment: Pressure on a nerve by soft tissue, cartilage or bone. The underlying principle of the science of reflexology is that reflex areas in the feet and hands correspond to glands, organs and other parts of your body. In this treatment, moderate to firm pressure is applied to these areas, releasing stagnant energies, inducing deep relaxation, and improving the overall performance of your body’s systems. This special form of massage is typically used before, during, and after athletic events to prepare the athlete for peak performance, to drain away fatigue, to relieve swelling, to reduce muscle tension, to promote flexibility and to prevent injuries. Depending on the needs of the athlete, a variety of techniques are used. Relax with a therapeutic massage in your own home. Let the pain and stress-reducing effects of massage sink in without the interruption of travel. Choose from any of our techniques. Call for additional information. High Touch, not High Tech! This one-hour upper body massage and myofascial release will focus on the very muscles that are fatigued and achy from hours at the desk or computer. Tell us about your dot.com body and we can focus on these areas of chronic tightness and alleviate accumulated stress. Tech Age Massage will focus on the back, shoulders, neck, arms, and hands and help with sinus and eye relief. We’ll add traction-action and length to stretch out your day! A unique synthesis of hatha yoga from India and acupressure from Thailand, Thai massage uses reflexology, gentle rocking, rhythmic compression, a variety of stretching movements, yoga postures, and work on the body’s energy lines to address specific problems, increase flexibility, and help you relax deeply. Iyengar yoga is a form of hatha yoga developed by BKS Iyengar. Many people refer to Iyengar Yoga as meditation in action. Nancy Sheehan, a senior therapist at Cranbury Therapeutic Massage, teaches Iyengar Yoga to both individuals and groups. Nancy’s classes are designed for practitioners of all ages and abilities. Nancy was certified as an Integral Yoga Teacher in 1982. She learned the Iyengar Method directly from the Iyengars during extended stays in India in 1994 and 2000. Currently she is a student of these senior teachers: Patricia Walden, Rammand Patel & Manusco Manos.